Today I finished recovering the inside of my cabinet. I wallpapered inside the cabinet with Waverly decorative fabric using wallpaper paste. My mother-in-law many years ago taught me how to cover the inside of my cabinet. I have been wanting to redo this for almost 15 years. Yep it is a UFO of a sort that is finished but not on my list. Prior to the Waverly it was covered in blue moire. It actually was a cotton print of moire. I had purchased cream moire to recover it but I didn't have enough yardage so I made a trip to Mary Jo's and purchased the Waverly fabric that was on sale for $3.99 a yard. How do you like my combination of Depression glass with Waterford Crystal? My china is on the very top shelf which one set was my grandmother's and the other was my great grandmother's. I enjoyed washing all of those dishes last evening thinking about my family. I sure do miss them. While pasting I sniffed in so much of the fumes I woke up with the worst headache that I had to take Advil and go back to bed until it subsided. 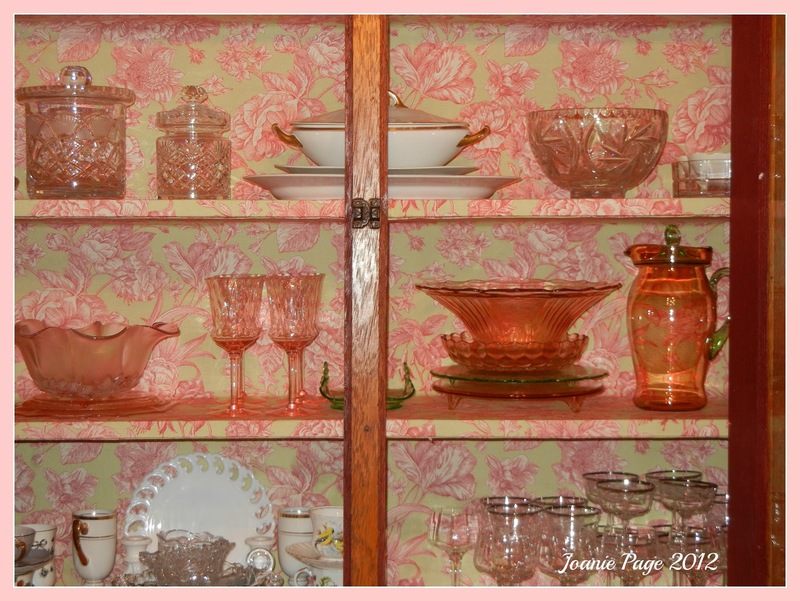 It finally did so I finished the last shelf this morning and was finally able to clean my dining room. The rest of the day I worked in my garden planting flowers. It was a gorgeous day. Amy Gibson at Craftsy has been demonstrating each month a new block technique. March was learning to foundation piece. If you have been following me you will know that this was not a new technique since ironically I just finished a quilt using the same identical pattern, the only difference is the finished block is smaller than the one I used to make my string scrappy quilt. 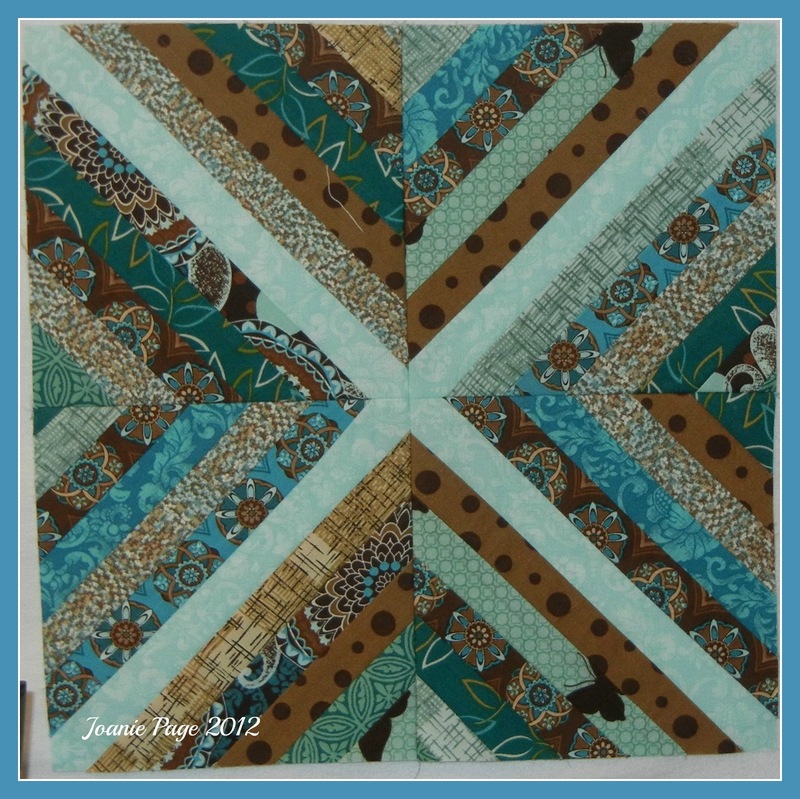 This is a fun block to make and I am looking forward to making the star foundation block, the 2nd March BOM and then on to complete April's BOM which features English Paper Piecing making hexies. Happy Quilting Everyone. I hope everyone is safe especially those of you living in Kansas where tornadoes have been coming with more to come.